It used to be the other way around – employers discarding applicants without the courtesy of replying to them. But in the current booming market recent research indicates that 41% of job applicants say they feel just fine ghosting a company during the recruiting process. Understanding why ghosting happens and how to combat it could very well be the difference between building a solid team and being stuck in the cycle of the perpetual revolving door. Here's three tips on how to get your talent to turn up. If someone takes the time to fill out a job application or craft a CV and cover letter, it’s safe to assume that that person is in fact looking for a job. And yet, according to some estimates, one in 10 job candidates don’t even show up for scheduled interviews. The problem is candidates often cast a wide net, applying to similar-sounding jobs in the same industry, and it becomes hard to tell one company from the other. The job you’re hiring for is lost in an indiscernible heap of career opportunities. In a world of AI and smart automation it’s easy to build a recruitment process that is employer, rather than candidate centric. And that's the wrong answer. Analysis suggested you’re far more likely to get a candidate in for an interview if you schedule it in the morning than in the afternoon. Monday morning between 9am and 10am in particular has proven to be the best time to schedule an interview, if you want to ensure they’ll show up. In fact they are as much as 27% more likely to be there. Also, be mindful of the way you interact with the candidate. It’s not just how you communicate with a candidate but also when. Don't keep them waiting for a response. 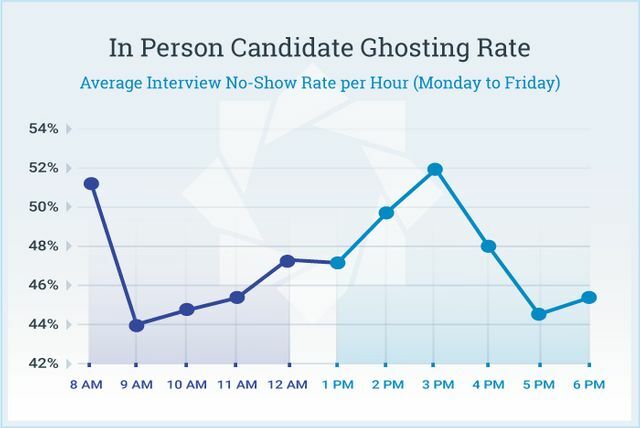 What Time to Schedule Your Interviews to Avoid Candidate Ghosting Timing plays a crucial part in “candidate ghosting” — specifically the time and day a candidate is scheduled to come in for an interview. Understand this point if you want to protect your recruiters and hiring manager’s time and your company’s bottom line. We analyzed more than 55,000 interview results for hourly positions over a period of 12 months. Our goal was to identify the main causes of candidate ghosting, an expensive and widespread issue that is haunting employers across the nation.